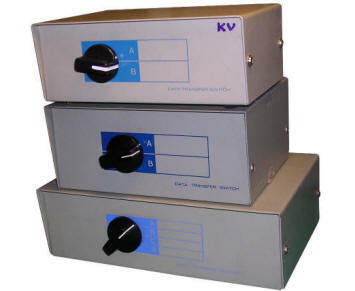 If you have a few computers but only one monitor, keyboard and mouse, in lab, workshop or server room, KVM is a very useful device - it allows to switch one console between different machines. 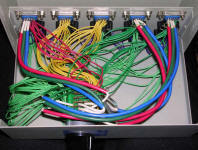 There are small switches to connect 2 computers switched with button, even smaller ones which use key combinations, or server room-grade machines to connect 8. 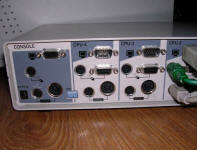 They may be used to switch VGA, PS/2, and later even USB. 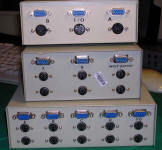 Mechanical KVM switches were made with the same technology as mechanical printer switches. 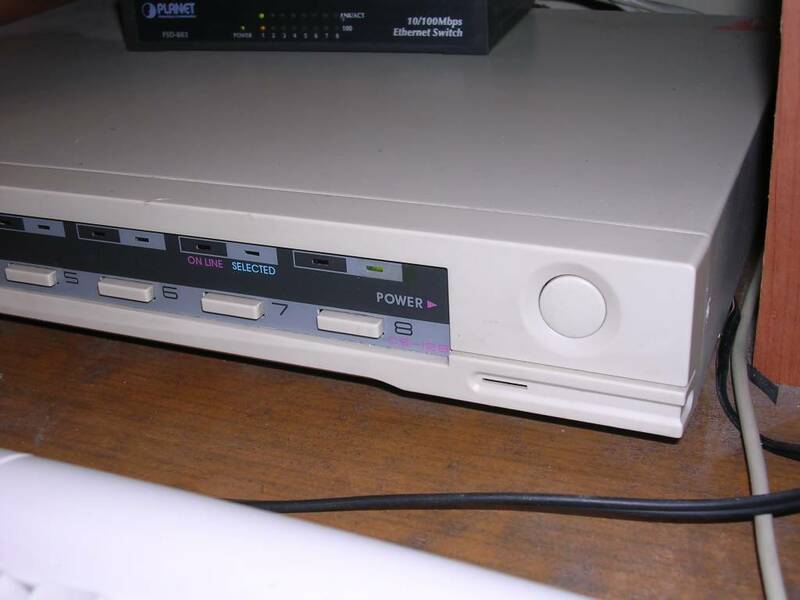 They were around since 1980s and had all problems of mechanical switches plus one more - they had problems with high frequency VGA signals, making high-resolution picture's quality significantly worse. 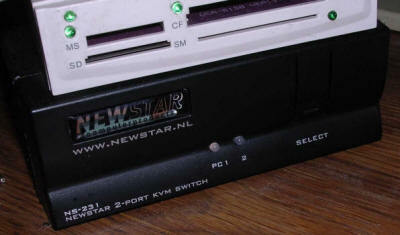 There are different versions, with DIN or PS/2 for keyboard, with mouse support or without. Inside, as always, a bunch of wires and mechanical switch. 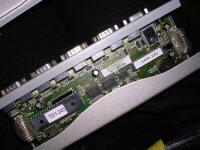 If your switch fails, look in printer switches page to find some fixing tips. PS/2 or DB9 female (for serial mouse). 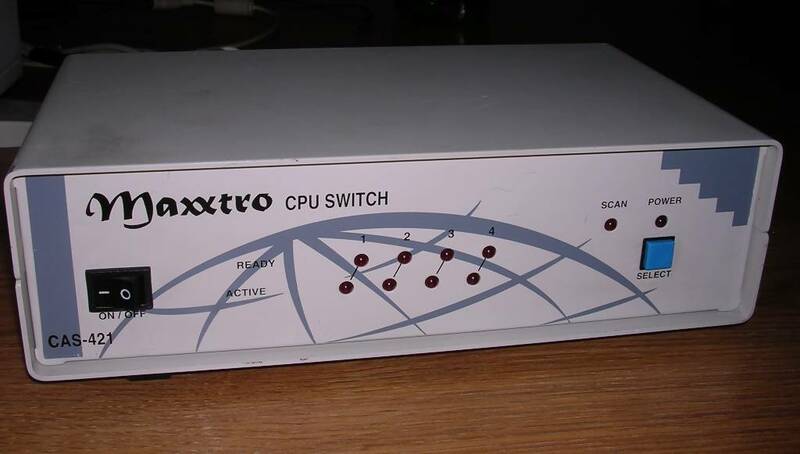 One of early electronic KVM switches, quite nice and durable. 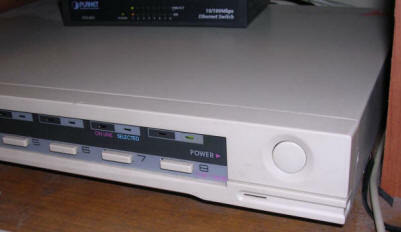 Its LEDs show power state of each computer and button allows to select one or use auto-selection based on which computer is turned on. Although it has both COM and PS/2 connections for mouse, it doesn't translate protocols so dual-standard mouse should be used. 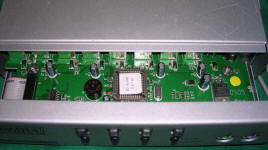 Inside it is based on Atmel microcontroller and digital cross-switch. Requires ca. 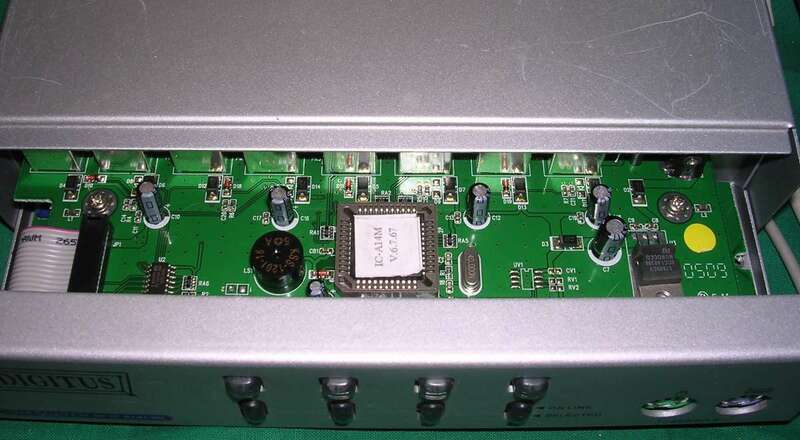 9V DC to be powered. 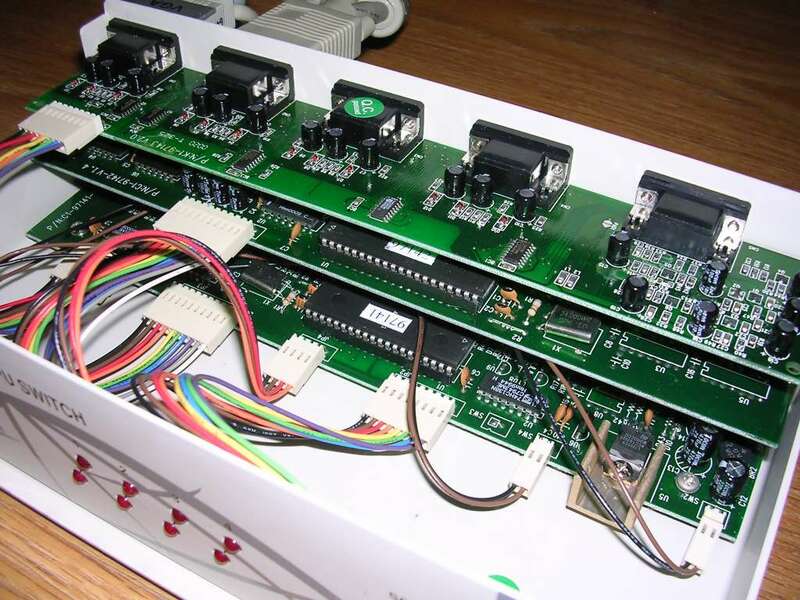 WARNING: DIP Switches in my unit are all on and it works. There is no documentation for it available and the docs for Gembird of the same designation describe totally different switch. 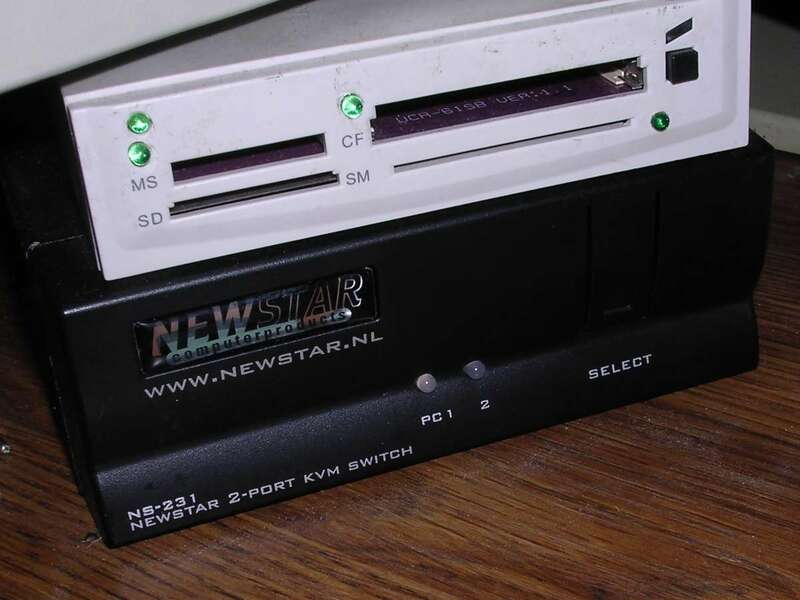 A popular small KVM switch which doesn't need external power supply - it powers itself from keyboard power of the computer turned on. Switching can be done by pressing button. If it cannot power itself (e.g. mainboard current is too small or keyboard takes too big current), it can be powered externally. 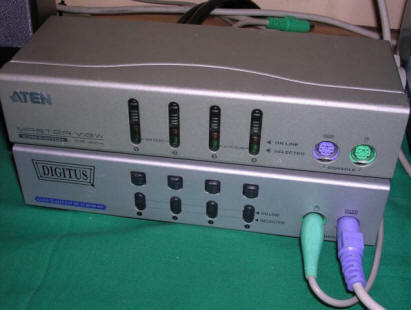 http://oldcomputer.info/hacks/kvmsound/ - Hack to add a sound switching to it. 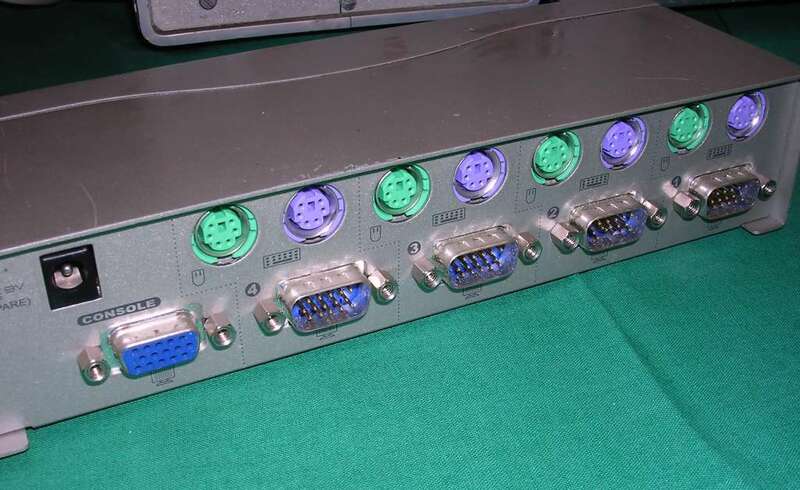 Sockets: PS/2, DIN for keyboard, 8x DB25 for proprietary cables. 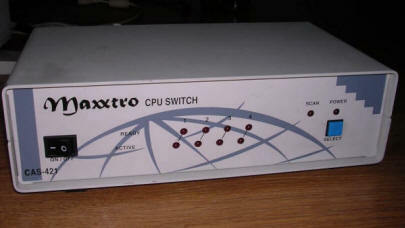 A server-grade KVM for 8 computers. 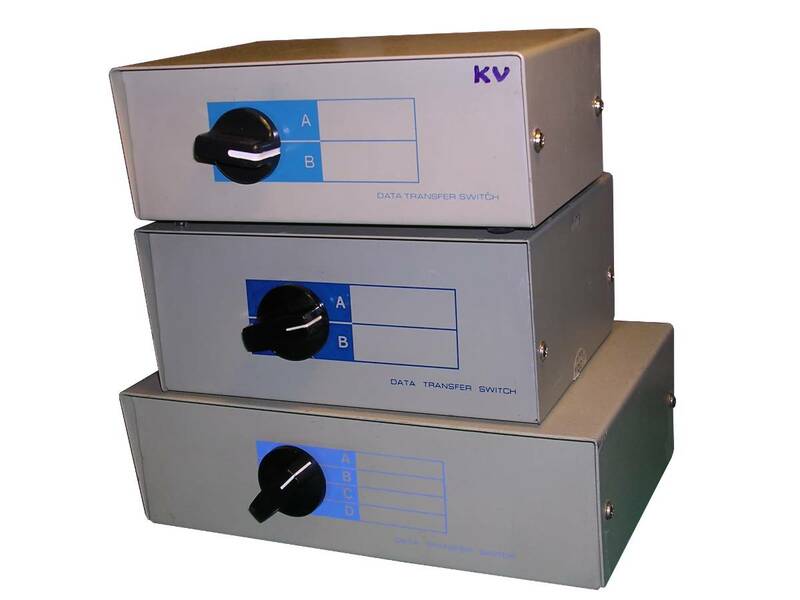 The width of its casing and mounting holes make it easy to mount this unit in rack. 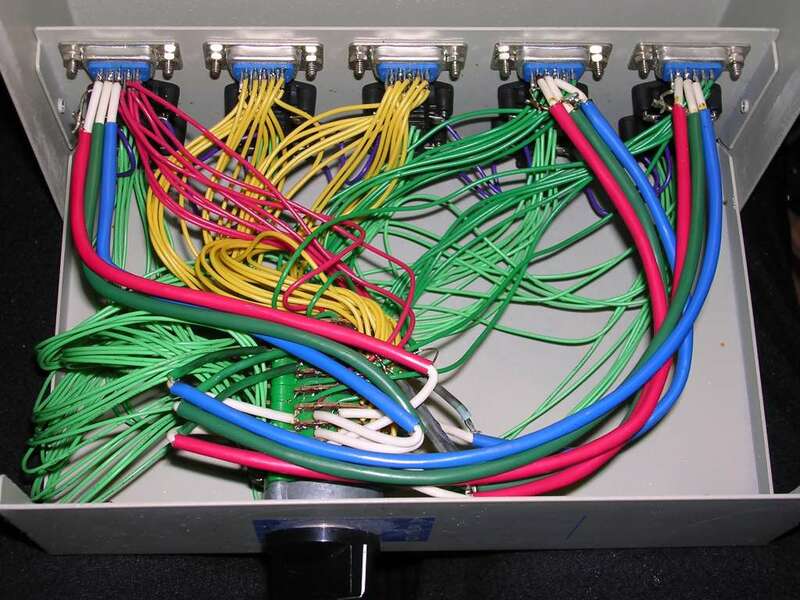 Unfortunately cables have own proprietary connector standard (see below for pinouts). Requires external power. To switch: Press Ctrl-Alt-Shift, release them. Press key with computer number, release it. Press Enter, release it. 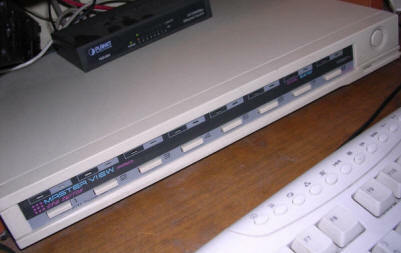 Front-panel buttons may work... or not - CS-128A is both for keyboard and has buttons active (+ OSD and probably some remote management), while CS-128, offered as OEM for some servers, is a lite version and may require resetting first by pressing buttons 1 and 2 simultaneously to make front-panel buttons work at all. I e-mailed with Aten support... and they told me this. I recommend to find some programmable keyboard and program switching combinations. 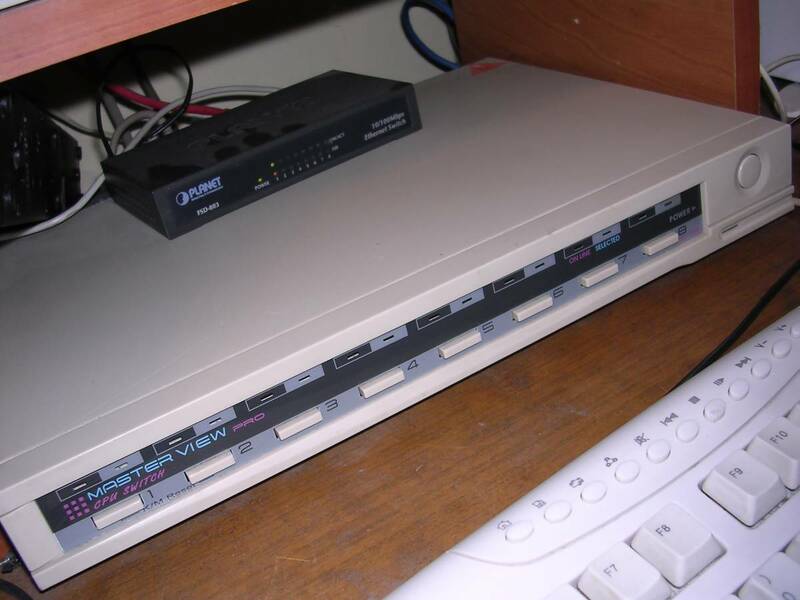 It coexists well with programmable keyboards if you don't program them through it. Then you definitely need some external power adapter (ca. 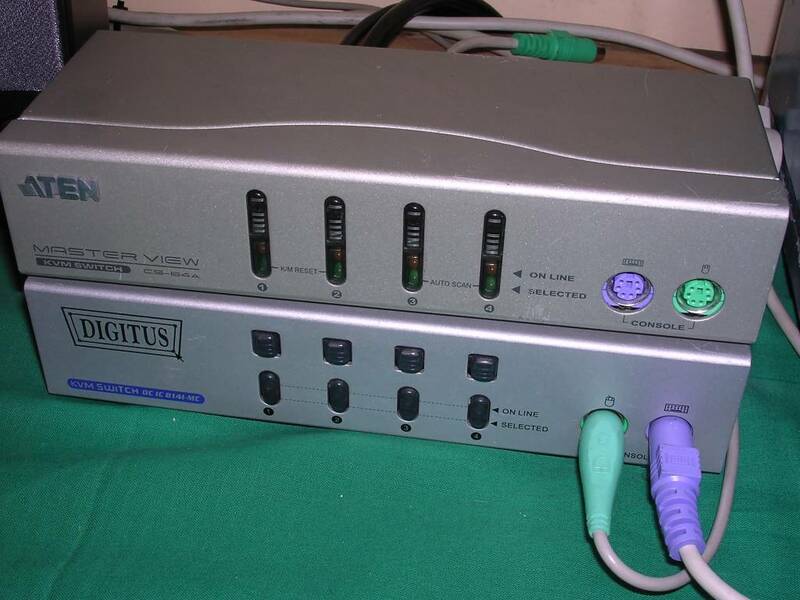 9V 0.15A is more than enough) to power both KVM and this keyboard. Sorry, no photo of inside and rear - I have it permanently under my display :). 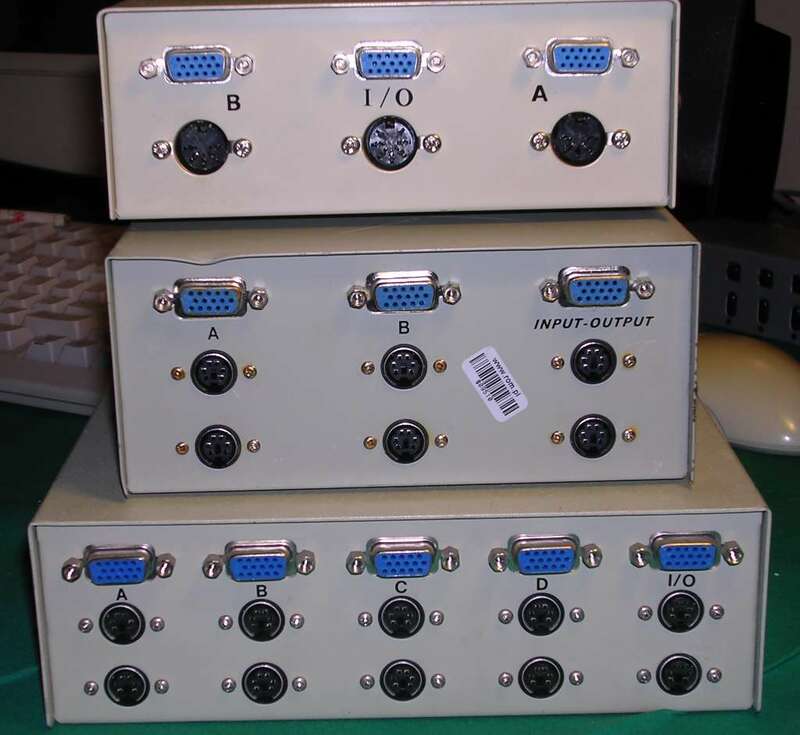 http://assets.aten.com/product/manual/cs_128a.pdf - Manual for CS-128A version. CS-128 has no advanced features!